We would like to thank Gregory for substituting for Jasmin this week, who has lost her voice. Gregory is working on a baby blanket (the baby was born three weeks ago). It is corner-to-corner, and has a few cables on it out of Baby Genius superwash wool. Gigi is working on the second red Regia Saturn sock. She is close to finishing the second sleeve tonight. Jasmin has cast on the Melon Lace shawl out of Victorian Lace Today out of the Tess' Yarns Superwash Merino Lace in "Mimosa Yellow". She has finished the spinning on the black and gold batt, and should be plying it tonight. With any luck, Gigi will be able to cast it on this week. Congrats to gnat (of the BarkNKnit podcast) on her recent nuptuals! They discuss the closure of Commuknity, which is the fifth LYS in our area to close this year. They discuss some of the ongoings in the related thread on Ravelry. Gigi and Greg discuss various blocking techniques. This includes, specifically, Galina Khmeleva's technique that is used on Orenburg Lace Shawls. Gigi runs into a forgetful snag during Saturday Social Knitting. We talk about the best gifts that we gave for Christmas. Gigi suggests taking notes now as to who appreciated which gifts to put in with your holiday acoutrements (a holiday knitting time capsule, if you will), so you will remember next Christmas. Gigi talks about giving her Wise Woman's Shawl by Bollweaver Yarns to Colleen's mom. Jasmin and Gigi have pulled some UFOs out of the closet! Jasmin picked up her Lady Eleanor again. Gigi knit one in 2006 out of SWTC's Karaoke, which she bought at Carolina Homespun. This is the project that got Gigi and Jasmin knitting backwards (the preferred method for knitting entrelac). Gigi is planning on knitting some entrelac socks out of Jasmin's handspun (the Freestone Firecracker). Jasmin's Lady Eleanor is knit out of the Paton's Soy Wool Stripes. Jasmin thinks that that WEBS still has the Noro Silk Chunky on sale. (Wrong, but it's still a good value.) This would make a FABULOUS Lady Eleanor. Jasmin was listening to Episode 20 of the Manic Purl podcast, and recommends it. It's about why we shop. Jasmin has finished the body of her Pride sweater. The pattern has some math problems, but it's basic. Gigi has unearthed her Neckdown Wrap Cardigan, which she is finishing for Jasmin. Jasmin found the Crystal Creek Batt that she was spinning for Gigi (the black and gold), so she's working on that. Gigi is working on a pair of Regia Galaxy socks, she's working on the Honeycomb socks from the Little Box of Socks (out of Black Wildfoote and Day-Glo Opal). Gigi has completed the Sharks watch cap for Sam. Jasmin is working on her Yucatan Orchid socks. Woo! The "Do some good" contest. Give what you can to who you can. The deadline for this contest is January 1st. Please let us know what you've done- either in our Ravelry group, or send us and e-mail. Prizes include three signed copies of Free Range Knitter by Stephanie Pearl-McPhee and two skeins of Malabrigo sock yarn. Our friend Teresa used to choose each project based on learning a new skill with each one. Gigi has decided to "do better". Gigi is practicing knitting without looking. Jasmin talks about some ways to start knitting in the dark. Jasmin apologizes for any misconceptions about the issue with the Knitpicks cable. They have phenomenal customer service. If you have experienced a problem with your Knitpicks needles, you can find their contact information here. Jasmin was on the hunt for needles. Apparently, the whole world is knitting with US size 3 and 4 Addi lace needles in the 60" length. (Jasmin needed these sizes/lengths to complete her Pride sweater, knitting two sleeves in the round at once using the Magic Loop technique.) Jasmin got excellent customer service at Commuknity! Gigi has a "when spending attacks", where she bought Jasmin all of the new colors of the Crown Mountain Superwash roving for her birthday/Christmas gifts. Jasmin and Gigi have been reading Stephanie Pearl-McPhee's and Franklin Habit's blogs, and have noticed that they're stressing over holiday knitting. Deny that urge to knit a last-minute holiday gift. Gigi is working on the Honeycomb Socks (from the Little Box of Socks) with Day-Glo Opal and Black Wildfoote. She's also working on a snickerdoodle sock. Jasmin has been working on her Santa Fe wrap. She has also finished spinning and plying her "Atlantis" sock yarn, from Crown Mountain. Jasmin has also been making some progress on the Maude vest. Jasmin decided to knit on her Maude vest while watching a local production of The Nutcracker. This segment is about knitting stripes in the dark. The "Do some good" contest- make the world a better place. Give a little of your time or resources, let us know, and become eligible to win one of three signed copies of Stephanie Pearl-McPhee's "Free Range Knitter". We're also including two skeins of the new Malabrigo sock yarn in the bucket of prizes. Gigi's Snickerdoodle socks bite back. The Knitmore Girls went to the Pajama Jammie Jam at Purlescence, and Gigi bought a bunch of Regia sock yarn, 2 skeins of the Franklin's Panopticon colorway of the Lorna's Laces shephard sock, 2 skeins of Argyle Socks (by Claudia's Handpainted yarns), and some Buffalo Gals yarnBrenda Patipa's "On the Vine" scarf. Jasmin bought 2 skeins of the the Panopticon colorway, 1 skein of Creatively Dyed "Ocean", and a JUMBO Ball winder. Jasmin thinks she wants to weave because she saw this thread on the Lisa Souza board on Ravelry. She's contemplating selling the giant loom in order to buy a smaller loom that is more size appropriate to her house. Jasmin finished her The Sea socks (out of the vintage Lisa Souza yarn)! She's also finished the Mesh Back Cardigan for Sandi. Jasmin cast on a pair of socks in the Schaefer "Anne" in the "Sarah" colorway. Inspired by Stephanie, Jasmin cast on the "Santa Fe Wrap" from Simply Shetland 3. She's knitting it in Noro Kureyon Sock (Color S185) and Jamieson Shetland Spindrift 2-ply in Purple Heather. She's also knitting the Maude Vest (from Simply Shetland 2) in Kauni (in W-EQ and W-EL). She's also cast on a pair of Mesmer socks in Ginger Cinnabar (Colinette Jitterbug). Gigi likes to put the date of purchase on her yarn. On Saturday, Gigi cast on the Regia Galaxy (in Saturn) with a Cobblestone cuff. Gigi finished her Upstream Socks. Gigi also bought some Araucania at Green Planet Yarns, which is going the be the Crystal Cove Pullover by Jill Vosburg. Jasmin is having a bout of seriously awesome knitting mojo. Jasmin is also knitting some Yucatan Orchid (mmmm... cashmere!) socks in hot pink. Give to charity, let us know, be eligible to win one of three signed copies of Stephanie Pearl-McPhee's "Free Range Knitter". Jasmin was listening to cogKNITive, and Dr. Gemma talked about Caps to the Capital, and how baby hats drastically decrease the incidence of infant mortality. Contest ends January 1st! Picking colors. You can get your colors "done" (like in the 80's). Look at the colors against your skin, in natural sunlight. Also, a good LYS will have employees who will give you good advice on colors. Take a friend with you- the brutally honest one - to help you. Also, the Knitmore Girls have personalized labels from Charm woven Labels. They're a brilliant finishing touch. Jasmin bought a backup project, and the necessary replacement needle. She finished the ball of heavyweight AND half a sock in the remaining day. Also, Jasmin is unenthused with the Socks that Rock heavyweight. The color is not saturated (meaning the core of the yarn is still white), and there are loads of joins in the yarn. Gigi is knitting Sam a beanie out of Claudia's Handpaints worsted (Sharks colorway). 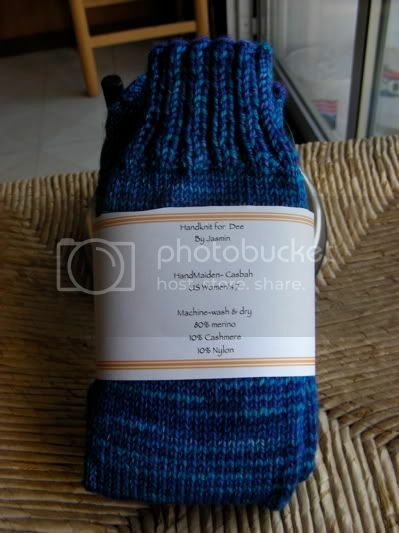 She is also knitting a sock in Meilenweit Jacquard (vanilla sock pattern) in with different shades of blue stripes, with Cat Bordhi's star toe. Jasmin is working on the second vintage Lisa Souza sock (in The Sea). She is SO CLOSE to finishing test knitting a sweater for Sandi (from Purlescence). It is knit in Manos silk/wool, in a lovely olive green. The Knitmore Girls advise against knitting yourself into hand pain. It's not worth it, and it's bad for you. If you develop hand pain, please see a physician. We'll be running our "Do some good" contest through January 1st. Give of yourselves either on a global level, or a local level and send us an e-mail about it. (If you give to Doctors Without Borders, please CC us on the email you send to Stephanie.) We have THREE signed copies of Free-Range Knitter. We will be airing our chat with Stephanie Pearl-McPhee (aka, The Yarn Harlot) in Episode 28, airing on 11/23/2008. The Yarn Thing/Knaked Knits KAL-CAL deadline has been extended to Thanksgiving (November 27th). Gigi recommends reading your notes. Carefully. She also recommends following directions carefully when you're executing a new technique for the first time. Custom Knits by Wendy Bernard. This is a fabulous book. (DO NOT let anyone make a duct tape dummy of you. You've been warned.) We love it. Do yourself a favor, get your hands on a copy. Gigi loves the "HOAX Fashion Formula" book from the '80s. Gigi has finished her Zig Zag Slip Stitch Socks! Jasmin finished her Mushroom Caps socks, and promptly cast on an Andrew-Style vanilla sock (ribbing all the way down the cuff, and the top of the foot) in a vintage Lisa Souza sock yarn in "The Sea". Jasmin is still working on her Sandi sweater in the Manos silk and wool (olive green). Despite how lovely the yarn is, the knots are vexing. Gigi is working on an Upstream sock, and a Foxglove Sock. The Upstream sock is being knit in a fall-ish colorway of Cherry Tree Hill sock yarn (missing the label, of course), and the Foxglove sock is in Blue Moon Socks that Rock in "Tiger's Eye". Jasmin loves wristers. Colleen made her a pair of Fetchings, and later, she knit a pair of theelbow-length wristers from Sally Melville's The Purl Stitch. Jasmin bought a little yarn. She got some Woobu in "In the Navy" and a sweater's worth of Heavyweight STR in "Pride". She also got a FABULOUS cardigan pattern (The Vermont Fiber Designs "Simple Cardigan"). Also, if you're knitting socks as gifts, shoot us an e-mail and we'll be happy to send you the label template, free! We got a cafepress order! Gigi got her 1000 Knitters shirt, and we both got Dolores 2008 and "I'm kind of a knitting superhero" mugs to inspire us. The "Do some good" contest! This is on your honor, so e-mail us once you've done your donating. Gigi has been flattened by her knitting. Her Knitting Pure and Simple Wrap Cardigan (out of Cascade Venezia) with shaping turned out ... wrong for her. But SO right for Jasmin! Jasmin's yarn refuses to cooperate, despite having been perfectly well-behaved while it was being wound. The Knitting Circle by Ann Hood. Four Knitmore thumbs down. Gigi has a new niece! Desiree had her baby! Our friend Mari talks about her work with Team in Training. You can read about it on her blog, or contact her on Ravelry to give. If you're not on Ravelry, you can contact Mari for details on how to donate atshewalks2008[AT]gmail[DOT]com . Changelings Knit and Stitch - Go and listen! Jasmin has finished her first Day-Glo sock (which is the same yarn as Gigi's contrast color for her ZZSS Socks), and started the second sock. The Social Pressure Experiment is going well. In addition to the 25 lbs of yarn that Jasmin got rid of last weekend, she's purged another 3 big bags. Tika finished her Elphaba Knee Socks, and got wine when we went to Unwined to listen to Juanita sing with the Jack Conway Trio. Gigi has been purging knitting bags. Jasmin likes her good bags (like the Amy Butler bag, or the Tom Bihn bag - especially the sock baggie), but noticed that she's always using the canvas bags from individual vendors. Gigi wants to hear from you: what makes an optimal knitting bag. Jasmin's Lily of the Valley shawl caught on the velcro in her work bag. Jasmin is a little over halfway done with spinning the yarn for her rainbow socks. Our friend, Ursula is knitting her husband a sweater with a bunch of texture, and was unsure as to whether the neck decreases would work out correctly. The solution? A neck swatch! Figure out the total number of neck decreases. Add a few stitches to that. Follow directions for neck decreases. It really works. Technology attacked, and the end result? New recording equipment for the podcast. Gigi cast on a sock out of the Tess' Yarns sock yarn (which Gigi and Jasmin both loooove! ), and neglected to swatch. The sock was eeeensy weensy! Jasmin should not do math for a Cat Bordhi sock at 11PM. When will I ever learn?! Your donations help the podcast run, so thanks a MILLION! The Cat Bordhi knitting joke & limerick contest deadline has been extended to Friday, November 7th. Send us your limericks and jokes! Which normally is a real blast. With Gigi watching nearby, aghast. Show notes to be posted. Gigi is working on the Zig Zag Slip Stitch Socks (out of Black Regia and Day-Glo colored Opal), Jasmin is doing a pair of vanilla socks out of the Day-Glo colored Opal. Jasmin is having problems getting rid of background noise in the interview with the Yarn Harlot - please send an e-mail if you're an audio whiz. Please. Jasmin is about to finish her second footprint (a la the Houdini Sock). Gigi is knitting Fortissima Colori (a sparkly one), using Judy's Magic Cast On (which we learned in Cat's class). Gigi is combining techniques from Cool Socks, Warm Feet and Cat's class. Jasmin is spinning hot pink sock yarn, and Going Home from Crown Mountain Farms. She also has commitment issues when it comes to big projects- whether it's knitting or spinning. Gigi asks, "When does a project become an 'UFO'?" Gigi has a stash full of yarn and nothing to knit. Stephanie Pearl-McPhee's sock washing method. Gigi learns that generic bobbins don't work so well in her Janome sewing machine. October 18th (Saturday) - Color Fiber Festival (in Berkeley). Jasmin will be there, with her hot pink hair. In favor of our chat with Cat Bordhi, we will be omitting our regular segments this week. New Pathways for Sock Knitters, Book One (Book Two is in progress!). We promise these socks are simpler than they seem! The 2009 Sock Summit. Be there ... or you know, read about it later. Lucy Neatby's DVDs- not to be missed! Lucy Neatby's Cool Socks for Warm Feet, and the Little Box of Socks. The Golden Gate Fiber Institute. Cat's novel - written in media res, like a moebius. Fancy Image Yarns - Gigi's first source of sock yarn. Gigi got some Kramer Yarns Sterling, Jasmin got some Kauni. Join our contest - Cat wants knitting jokes! Submit your jokes to us at knitmoregirls@yahoo.com. Prizes include signed copies of A Treasury of Magical Knitting and New Pathways for Sock Knitters, Book One . Jasmin finished her Baby Surprise Jacket, and her Sirius socks. She is casting on a new pair of handspun socks out of Pigeonroof Studios "Mushroom Caps." Gigi is knitting a "vanilla sock" out of Lana grossa Meilenweit in color 5565 (it looks like Trekking), with a Strong Heel (from the Little Box of Socks). Jasmin is working on a sweater for the Purlescence gals (one of their original designs) out of the Manos Silk and Wool. Jasmin finished the spinning on her Pigeonroof Studios Superwash Blue Faced Leicester in "Violet Cherry." Gigi is knitting the Knitting Pure and Simple Wrap Cardigan in Cascade Venezia. Gigi had killer dust bunnies (with BIG TEETH!) in her sewing machine. When you're done sewing, take the little brush, and tidy up your machine. A keyboard vaccuum and compressed air also work nicely for sewing machine maintenence/clean-up. Ursula bought Gigi this magnetic light for her sewing machine! Jasmin loves continued education, and she and Gigi will be taking a class from Cat Bordhi in Lafayette, CA on Saturday, September 27th at Yarn Boutique. The Stitches West class catalog is up! Cat Bordhi's classes at Yarn Boutique! Saturday, October 4th- The Yarn Harlot. Copperfield's Books in Santa Rosa. Gigi has finished her Olympic Sweater and her Waves and Piers socks (from the Little Box of Socks). She has run out of UFOs! Jasmin has finished her Hedera Socks (made of copper-colored Koigu) and her fuschia ribbon shell (made of the Tess Designer Yarns Microfiber Ribbon). [Tess Yarns is also a mother-daughter operation!] Follow the direction on the label as to how to wind the ribbon, and use Fray-Chek to secure your end. You'll thank us later. Jasmin suggests watching an episode of something (like Deadwood [Mature Content], Big Bang Theory, or Shark Attack in the Mediterranean) while you carefully wind the ribbon. Jasmin has spun some day-glo colored sock yarn out of CrazyMonkey roving. It's FABULOUS and retina-searing. Hunting for inspiration, Jasmin tripped across the Henley Perfected in Ravelry. I "favorite"d this one. Gigi's collar on her Olympic Sweater was... off. She "auf'd" it, and reknitted it. Twice. It's better now. Jasmin's knitting is not agreeing with her. Jasmin bought the mohair pictured above (with No-Blog-Rachel) for the Cardigan to Love. After a long day, late at night, Jasmin messed up the sweater on row 5 of the lace pattern. In mohair. That now needs ripping. Jasmin went stash diving and cast on the Henley Perfected. Gigi does Tai Chi. And some Olympic Knitting. Gigi is working on her Chic Knits Basic Chic Pulli and Jasmin is plugging along on her Ribbi Cardi. (Changes can be found later on the Ravelry project page.) Gigi will be setting in the zipper on Jasmin's Ribbi Cardi. Jasmin is alternating Olympic Knitting with a little spinning. Pigeonroof Studios Superwash Merino in "Mushroom Caps". Safety first! Alternate knitting with other tasks to reduce risk of repetitive stress injuries. Remember to ice. If you must take an anti-inflammatory/painkiller, do, but put. Down. The. Knitting. Be safe. Being brilliant is not genetic, and Jasmin is living proof. Tai Chi in the Rose Garden- Held in the San Jose Municipal Rose Garden. Taught by Greg McKenna. Gigi is working on Double basket socks- Sock #2. She has finished the "Right side wrong side cable" socks. She's running out of UFOs! Gigi is swatching for her Knitting Olympics Project. This week, she has swatched the Freestone Firecracker handspun (pictured above) and the Creatively Dyed Ocean. Jasmin has finished the first Butter Peeps sock (and is working on the second), and is plugging away at a handspun sock. She's knitting on a sock out of Creatively Dyed Ocean, Magic Loop style. Jasmin has been keeping to the Social Pressure Experiment. Both Jasmin and Gigi will be reviewing Shibui sock yarn- on a future episode. Review: All's Well That Ends Well- Shakespeare Santa Cruz. Jasmin isn't sure if the story or the production she didn't like. Listen for details. -Do all your planning now. Avoid heartache. Avoiding Olympic injury! Set a timer- every 15 minutes, get up and stretch. Do a Sun Salutation. Catch a bathroom break, drink water. If your hands start to hurt, stop knitting right away, and go ice them. Eat frequently and healthily. We're Olympians! Evidently, not being able to count is genetic. Who'd have thought? Gigi is still working her way through the Little Box of Socks. She's hoping to knit herself a pair of Roman Rib socks. This week, we interview Franklin Habit. "It Itches" will be launching in October at the New York Sheep and Wool Festival (Rhinebeck). Check out the preview. We talk about "It Itches", and the 1000 Knitters Project. Franklin is charming, and we are charmed by him. Jasmin tells Franklin that his lace was what inspired her to knit lace. Franklin's current yarn obsession is with silk. Read about it! We talk about the sheep in the room: 2008 Fibertarian Presidential Candidate, Delores Van Hoofen. Nominee Van Hoofen is calling out her Canadian Fibertarian competition. Bring it, Stephanie! We also talk about the Lorna's Laces Franklin's Panopticon colorway! Jasmin conveys No-blog-Rachel's long-standing love for Franklin. He loves you back! Readers: don't be shy! Talk to Franklin. He's terribly sweet. Jasmin likes the Yarn Girls' books for handpainted yarns. If you'd like the template (in Word), shoot us an e-mail and we'll send it to you. Right side wrong side socks - Gigi (from the Little Box of Socks) knit with the Jojoland Melody sock yarn. Persephone scarf- Jasmin - by Miriam Felton (she also designed the Juno Regina). Out of handspun Buffalo Gals bison. Mystery socks are: Pagewood Farms Yukon Bamboo Sock yarn. Gigi is knitting the Baby Yeti, Jasmin is knitting the Garter Rib sweater. Memorial Day sales lend themselves well to splurging on cashmere. Get out and knit! Socialize! Go to Stitch and Pitch! Spinning at the Retzlaff Winery- Saturday, May 31st. Swatching for the Not-Your-Standard-Issue Sweatshirt from the Yarn Girls' Guide To Simple Knits. To dart or not to dart? In Divé Autunno. More spinning than knitting. "Blackberry Swirl" from Fiber Fiend in Superwash Corriedale. We placed a co-op order from Crown Mountain Farms. We love Klaus! (We also love his superwash merino roving!) He's also dyeing yarns now. Gigi realizes that there is not enough yardage in the Artyarns Supermerino worsted to knit them on itty bitty needles. Jasmin is still Sock Blocked. Swatch for your socks. Really. Graft "Hand wash only" socks with red yarn. This is a visual cue to not just throw them in the wash. Also, differentiated labels (red font vs black font) are also quite effective. We love your feedback! We'll respond to every comment and e-mail - please remember to include your e-mail address (in the given spot) with your comments! Let us know if there's a topic you'd like to have covered. Plan ahead. Start your winter holiday knitting now! We know it's hot, but really, you'll thank us later. The First Knitmore Girls Knit-a-Long! Happy Mother's Day! Have a margarita. Pause the podcast and call your mother! Done? Good, let's move on. Gigi reminisces on past Mother's days. Jasmin's Einstein kills her knitting mojo. Gigi finishes it, and Jasmin gives the accursed thing to Ursula. This week, we talk about TV shows to knit by. -Jasmin can't close a toe. - Cast on both socks simultaneously. - Cast on Second sock as SOON as the first sock has been completed. This week, Gigi has startitis and works on her (slightly troubled) t-shirt sweater. Jasmin is working on her hot pink Ice Queen, and buys some roving (for science!) at Color: A Fiber Festival. Travel season = travel knitting. When flying, please remember- many of the decisions are left to the discretion of the individual TSA agents. The link to the TSA website for the "forbidden stuff" list can be found here. Jasmin talks about knitting bag/ purse selections. Gigi points out the awesomeness of Knitting Daily. Jasmin buys a (heir)loom, Gigi knits socks. We talk about ergonomics in knitting, and Jasmin has a crisis as to what to knit with her Noro Kureyon Sock yarn. Any ideas?